Insight: According to Dr. J. A. Hogsette of the USDA-Agricultural Research Service and the University of Florida, its former name was Ophyra aenescens. It is native to the United States as well as Central and South America. Black fly larvae don't need to feed on other fly larvae to live. They can develop naturally on the nutrients from the manure. Notes: Dump flies can kill up to twenty house fly larvae a day--a rare example of an animal killing more than it can eat. Dump flies do not feed or rest on animals or humans. 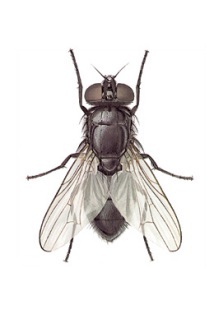 Black dump flies have been used successfully in poultry and swine houses, according to Dr. Hogsette. The larvae seem to prefer manures that are comparatively low in fibrous materials. They do not develop well in manures of cattle, horses, sheep, or goats. That apparently means they prefer poultry, dog, and cat manure.